Governor Jerry Brown’s signing of a sweeping mandatory childhood vaccination bill – ending exemptions from state immunization laws based on personal or religious beliefs – is aligned with the priorities of nearly 3 out of 4 parents in Los Angeles County. The bill, SB 277, was supported by First 5 LA’s state legislative agenda and introduced to the legislature by Sen. Dr. Richard Pan (D-Sacramento) and Sen. Ben Allen (D-Santa Monica) following an outbreak of measles at Disneyland that infected more than 130 people and at a time of concern about declining vaccination rates in some communities. SB 277 eliminates the personal belief exemption from the requirement that children receive vaccines for certain infectious diseases prior to being admitted to any public or private elementary or secondary school or day care center. The bill exempts children whose family medical histories lead a physician to recommend against immunization. A majority of parents in L.A. County seem to agree with the bill’s intent to vaccinate children prior to entering school. According to a new report released by the Los Angeles County Department of Public Health (DPH), over 74 percent of parents thought that parents should not be allowed to send their children to school without immunizations. Overall, 81 percent of parents felt it was safe to vaccinate a child ages 0–1, the report said. In L.A. County, 86 percent of kindergartners were up to date with required immunizations in 2014, slightly less than the statewide number of 90 percent. 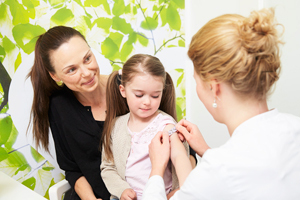 Personal belief exemptions (PBEs) may be contributing to the declining vaccination rate for school-required immunizations that has been observed recently. This year, 13,592 kindergartners in California were not vaccinated due to personal belief exemptions, according to kidsdata.org. Although only 1.6 percent of kindergarten students in L.A. County were not fully immunized due to PBEs, evidence suggests that these parents tend to cluster in selected communities. For example, the West Service Planning Area (SPA) had the highest percent of kindergarten students with PBEs, at 6.4 percent, while the South SPA had the lowest, with 0.1 percent, according to the DPH report. According to the Centers for Disease Control, 16 diseases are currently preventable for children and adolescents through routine use of vaccines. While many diseases historically have had very high incidence in school-aged children because of the high potential for transmission in congregate settings, outbreaks have occurred at earlier ages with more children in preschool programs. In California, one of those childhood diseases with the highest risk for infants and young children, yet preventable through vaccination, is whooping cough. Cases of this disease, also known as pertussis, have risen in the U.S. over the past decade. And according to new research by kidsdata.org, the Golden State is home to 39 percent of the nation’s whooping cough cases, even though California’s population represents only 12 percent of the total U.S. population. SB 277 will go into effect January 1, 2016.